Adair took 3 for 16 removing William Porterfield, Aaron Gillespie and Stuart Thompson cheaply after the home side surprisingly decided to bat first once the game got under way 30 minutes after the scheduled start. The pitch offered considerable assistance to the bowlers throughout the contest, especially when there was cloud cover. In between Adair’s opening salvo, David Rankin sacrificed his wicket stepping out of his crease after he and Niall O’Brien ended up at the one end, the Warriors were deep in the mire at 24 for 4. It got worse shortly afterwards as Andy McBrine (13) edged James McCollum to a grateful Chris Dougherty at slip, allowing the CIYMS man to atone for a bad miss from the exact same shot the previous delivery. Graham Kennedy counter-attacked to lead a recovery, as he hit five boundaries in an entertaining 36 from 37 balls, dominating a 6th wicket stand of 49 with Niall O’Brien. 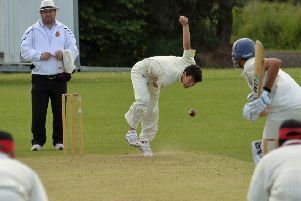 The introduction of spinners James Cameron-Dow and Jacob Mulder saw wickets continue to fall with the pair taking two apiece. O’Brien broke the shackles, clubbing Mulder twice into the adjoining houses, as he scored an unbeaten 54 from 91 balls, but trying to retain the strike, he was involved in another run out as last man Ryan MacBeth’s desperate dive just failed. 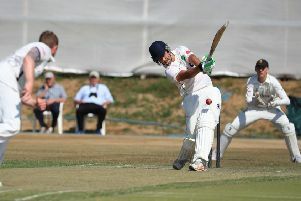 A Warriors total of 139 was certainly below par, but David Scanlon struck twice dismissing Adam Dennison and James McCollum in a tricky pre-lunch period to give the Warriors hope. Chris Dougherty looked assured as he settled the Knights nerves, missing resolute defence with the occasional attacking stroke, including one six into the car park. Marc Ellison (19), Harry Tector (13), and Shane Getkate (13) stayed with Dougherty and at 112 for 4, the contest looked set for a routine chase. However, McBrine (3-37) struck twice in two balls trapping Dougherty (46), and then having Mark Adair caught bat/pad first ball. Kennedy then had Getkate superbly caught by O’Brien standing up to make it a team hat-trick. 112 for 4 had suddenly became 112 for 7 and the 140 target looked far off. Neil Rock (14*), and Jacob Mulder (11) dispatched a few loose deliveries and although Mulder fell with five needed, the injured Stephen Bunting hobbled out and thumped the winning boundary to give the Knights a welcome win. The defeat means the Warriors must not only beat Leinster Ligtning in the final game, but also by a considerable margin to deny the Dubliners another title. The Warriors have a chance of instant revenge as the teams face each other in a three-day Championship clash which gets under way at Bready today (TUES) at 11 am. A Warriors win would almost certainly guarantee them the Championship crown for the first time since the competition was revamped in 2013.